In the past when looking into, and tirelessly tasting, the snacks of Walt Disney World, we have come across gigantic cookies, clever twists on classic desserts, and even tricked out cupcakes. However, there is at least one baked good we haven’t sampled yet, brownies. Well, my salivating companions, that changes today, when we head to Disney’s Animal Kingdom in search of a behemoth brownie. The Brownie Paw can be found back in Africa at Kusafiri Coffee Shop and Bakery. Among the other bakery items, including turnovers, cinnamon rolls and croissants, are a trio of top tier treats. 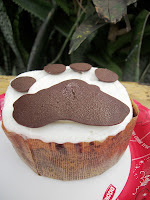 The problem for the Brownie Paw is that it appears smaller and has less swagger and trimmings than its older siblings, the Zebra Cupcake and White Chocolate Elephant Cupcake. The idea that the Brownie Paw is not as worthy of valuable consumption time is a gross miscalculation. Bits of molded chocolate form an animal track atop a slab of rich, smooth buttercream. Beneath this first layer is a thick tier of fudge that is filled with gooey, chocolatey goodness that is the consistency of ganache. Once the sugary sucker-punch subsides, there is still a brownie that tiptoes the line between chewy and dense like a pro. While it may not have the height of its Kusafiri counterparts, the Brownie Paw delivers the baked goods on all fronts. It is also the perfect snack to split with a child who may not be feeling up to the adventurous spectacle of the Zebra and White Chocolate Elephant cupcakes. It seems that with each progressive year the selection of bakery snacks continues to become more diverse, introducing new ingredients and dessert forms, and better quality. The Brownie Paw has been hiding in the shadows for a while now, but is a delicious twist on a childhood favorite. The next time you are hanging in Harambe, remember this bodacious brownie, you won’t regret it!